BOOK YOUR CHURCH'S PERFORMANCE TODAY! with an even more powerful message from the Bible. Ephesians 6:10-11 (New International Version) - The Armor of God. Finally, be strong in the Lord and in his mighty power. Put on the full armor of God so that you can take your stand against the devil's schemes. Since the 1990's with hit shows like Walker, Texas Ranger and The Power Rangers, the Martial Arts have became mainstream entertainment in America. The Martial Arts have also become a very popular activity for children with karate, tae kwon do and kung fu being taught in virtually every community in America. 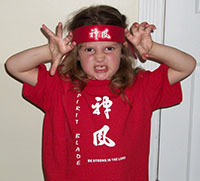 Spirit Blade wishes to use the martial arts as a tool to help spread the Gospel. Spirit Blade currently is an approximately 40 minute live martial arts demonstration. Weapons, breaking, and dramatized fight scenes mixed with a little music and comedy help make up the exciting show. Biblical messages are woven throughout the performance and there is a brief testimony and simple Gospel presentation. call Steve Gross at 815.953.5786 or email him. Minimum performance space 12 x 12 feet with 8 feet of space between performance area and front row of audience. Spirit Blade uses House Sound (your church's) for all events. We will need 1 hour set up time. Spirit Blade can help provide your church or ministry with promotional material (flyers, posters and info cards) to aid in promoting the performance and maximize attendence. Performance time is approximately 40 minutes. Spirit Blade is a great addition to your church's Vacation Bible School.